Ben Mayhew (@experimental361) has made very interesting representative graphs of shot effectiveness amongst all team in Europe's top 5 leagues. The cross where the two lines meet is the statistical average, and he has classified the four separate quadrants as follows: Ineffectual, Languidly Clinical, Energentically Wasteful and Constant Threat. They are unsurprisingly in the 'energetically wasteful' quadrant (top-right). However, so far this season, they have significantly increased their shots per game and take about 4 more shots each game compared to last season. Their efficiency has improved slightly - it now takes 10 shots for them to score, as opposed to 11 last year. Well, basically they are still wasteful in front of goal. However they are improving on all fronts. Liverpool are very very close to breaking into the ideal 'Constant Threat' quadrant (i.e. a team which takes a lot of shots and converts them into goals more often). Similarly they have almost reached the average shot conversion rate across all leagues, which is an improvement and should result in more goals with the amount of shots they take. So Liverpool are being both more productive and more clinical in their attacking this year - but they still need to be more clinical and are still failing somewhat in this area. (Or perhaps they need to shoot less and try to wait to fashion better goalscoring opportunities). This is the biggest difference between Liverpool and the teams challenging at the top of the table. 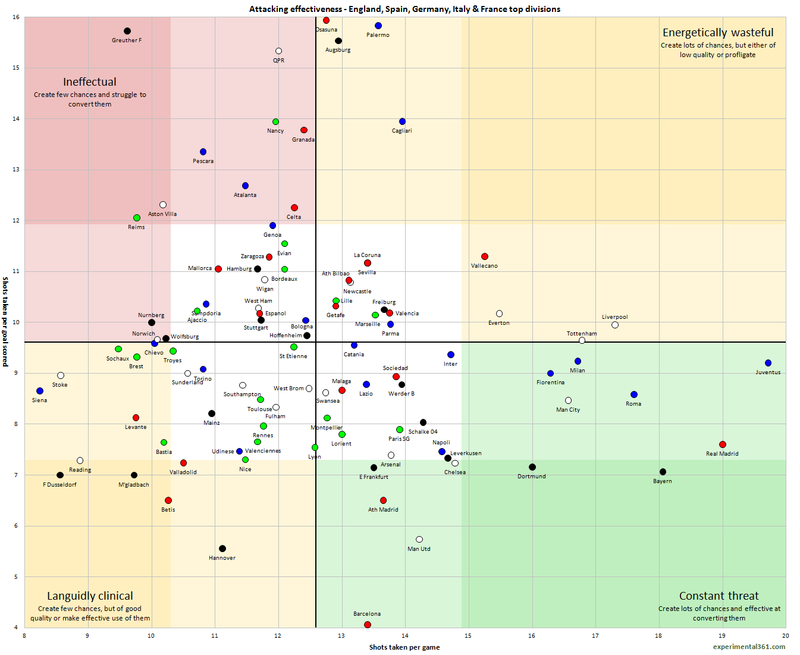 Liverpool are in the bottom left quadrant here, described as 'Avoiding the Issue' - they restrict opponents chances (facing just over 10 shots per game on average) but the defence is easily breached (it only takes about 8 shots for an opponent to score). So similar to their attack, it would suggest that Liverpool are 'dominating' games, but when it comes to crucial moments they are not being effective. 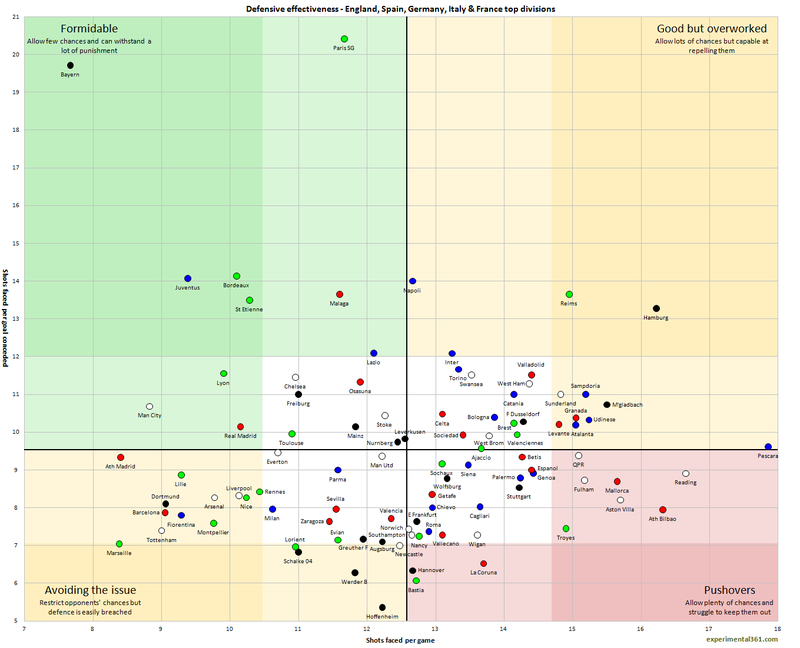 This could be read as a tactical issue as well - if you look at other teams in their quadrant (such as Spurs and Barcelona), these are teams that press high up the field, thus dominating possession, restricting the opponents' ability to play in their half, but leaving a lot of space in behind, which, if penetrated, is clearly going to allow better chances. So as with the attacking, it's probably a trade-off - it's probably not possible to drastically improve one area while leaving the other steady. But certainly it could be improved moderately. Liverpool are not too far from the average, and moving into the 'Formidable' quadrant. So, to conclude, it seems like Liverpool are doing the 'right' things on the pitch, preventing shots against them and shooting lots against their opponents. However, their opponents are being more clinical - they need 8.25 shots to score against Liverpool, while Liverpool need 10 to score against their opponents. Liverpool need to be more clinical in front of goal, and more effective at repelling the relatively few attacks that come there way. Rodgers may also need to rethink tactics, or the players reconsider their decision-making, as as I suggested it's probably difficult to improve one area significantly without the other dropping off. So perhaps they need to stop shooting from range quite so much, hold on to the ball and create a more convertible shooting chance in attack - Barcelona are perhaps the ideal model to follow here as they score a goal every 4 shots (an incredibly clinical conversion rate), and it is rare that you see them shooting from range, preferring to hold onto the ball for sustained periods in order to create the perfect chance. Likewise, in defence, Liverpool could perhaps allow more space for their opponents in front of the defence and in midfield areas in order to prevent easier scoring opportunities being created against them. That said, better finishing in attack and less errors from Reina and the defence could achieve this more clinical shift without Rodgers having to sacrifice the generally very productive play too much. To summarise, I would say the signs are good for Liverpool from looking at the graphs. If they can be more clinical and effective they could be formidable in both attack and defence.